John Wesley Bookwalter : Waikiki, 1874. 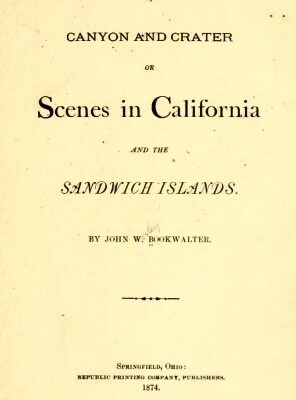 Scenes in California and the Sandwich Islands. Republic Printing Company, Springfield, Ohio, 1874. At Waikiki, some three miles from the city, is a very pleasant bathing place. It was the sea side resort of "Kamehameha Fifth." As this royal Kanaka kicked the beam at something over 400 pounds, it became a matter of much concern as to how all this royal substance could be transported with the least discomfort to his ponderous majesty. To this circumstance the tourist is indebted for the privilege of reaching Waikiki by a pleasant drive over one of the finest roads I ever met with. It ought to be good, for it is about the only road in the entire kingdom. Inter-transportation is effected in all the islands by ponies and donkeys. I saw at this place for the first time, that famous sport of the natives, "surf bathing." digious force, dashing the water into immense snowy fleeces. works his way far out to sea. 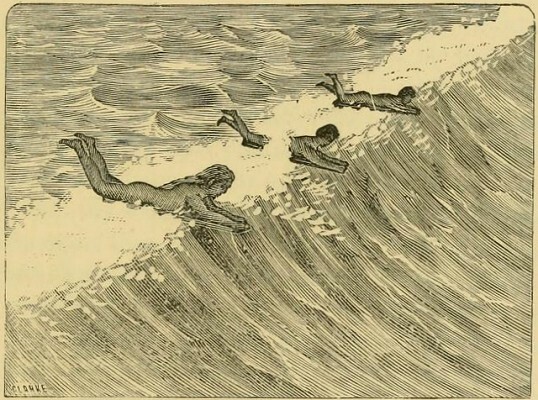 Watching his opportunity on the approach of an unusually heavy surf, he dextrously flings himself into it a little forward of the crest, slightly inclines the board to receive the forward impulse of the water, and with the speed of the wind rushes toward the shore, enveloped in a fleecy foam and spray. resident whites, one who is equal to the feat. It is the most exciting sport I ever witnessed. In the distance, projecting its clear, well cut, serrated edge against the blue sky, rises an isolated peak called Diamond Point. It is a long since extinct volcano, about one thousand feet in hight, having in its summit what is said to be the most symmetrical crater in the islands, forming a regular, almost circular cavity, like a huge punch-bowl. the snowy crest of the waves. They are constructed mostly out of a very firm hard wood called '* Koa," and sometimes of a wood closely resembling it, called the "Kou." They are of extreme length as compared with the width, so narrow in fact that a man of good proportions would have to limit himself to a very frugal dinner if he preferred to sit down, rather than be compelled to stand up like a "Colossus of Rhodes " in one of them. They would be no doubt completely unmanageable, were it not for a device employed on all the canoes of the South Seas, which is called an out-rigger. these two pieces at their ends, and lashed in a similar way is a piece of very light, porous wood called " will will," which floats upon the surface of the water at a distance of about ten feet from the side of the boat, adding greatly to its stability. ble, and would have no greater difficulty in preserving his balance, were he to attempt to navigate the Atlantic in a butter-bowl. Yet the bold manner in which the natives plunge out into the roughest seas, and the skill with which they manage these light, treacherous craft, even in a raging surf, is a marvel to behold. In fitting out a fleet for warlike purposes, it was once their custom, in former times, to lash quite a number of these canoes together, side by side, rendering outriggers unnecessary, and thus forming a kind of compound boat, of considerable capacity and quite serviceable. 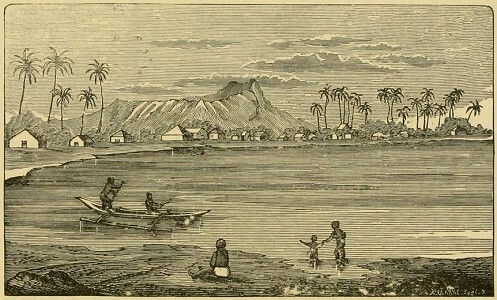 It is said that Kamehameha 1st made his tour of conquest among these islands in boats constructed in the manner described. Geoff Cater (2013) : John Wesley Bookwalter : Waikiki, 1874.